Eagle Superabrasives is a one-stop shop located in Hickory, NC that specializes in high-quality Superabrasive products and offers the best customer service in the Industry. With an extensive inventory of over 6,000 Diamond, CDX and CBN wheels to choose from, Eagle Superabrasives is a leading source of Superabrasive supplies in the United States. In fact, ninety-percent of orders are on location and are ready for same-day shipping. Have a custom order? No problem, we can fill custom orders in as little as seven days. So don’t settle for subpar Superabrasives; contact the experts at Eagle Superabrasives for all your grinding needs. Named for its cubic form of boron nitride (cBN), the CBN crystal structure rivals earth’s hardest material, the diamond. CBN grains have fifty-five times higher thermal conductivity and four times higher the abrasive resistance and twice the hardness of conventional grinding wheels meaning that when applied to a grinding wheel (CBN Wheel), it is well suited for grinding of high speed steel and super-alloys. The grains of CBN do not chemically react with a lot of difficult to grind (DTG) materials allowing CBN particles to maintain their strength at temperatures that exceed 10000c. CBN wheels offer a cool-cutting, consistently sharp and burn-free cutting edges and no loss of hardness during extended use. To keep the manufacturing flow as efficient as possible Eagle Superabrasives recommends a CBN wheel over the conventional grinding wheel. The conventional grinding wheel, typically composed of aluminum oxide and silicon carbide have been proven to dull faster and burnish materials reducing the effectiveness of grinding productivity. Implementing a CBN wheel over a conventional grinding wheel results in less downtime, less time gauging and measuring, less wheel changes, thus increasing grinding efficiency and productivity. If you would like to read more about CBN Wheels click here. Whether you are looking for advice on which product will benefit you best or are ready to purchase, our experienced staff at Eagle Superabrasives will provide support and advice along the way. 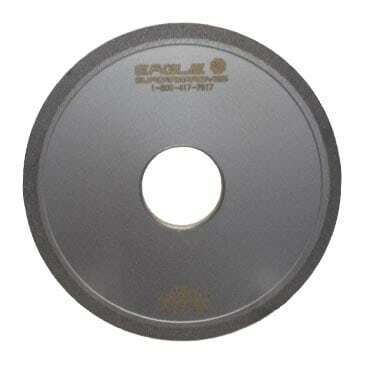 With unprecedented customer service, decades of experience, superior products and fast shipping, Eagle Superabrasives is an easy choice for all your grinding needs. Contact us today to place an order!